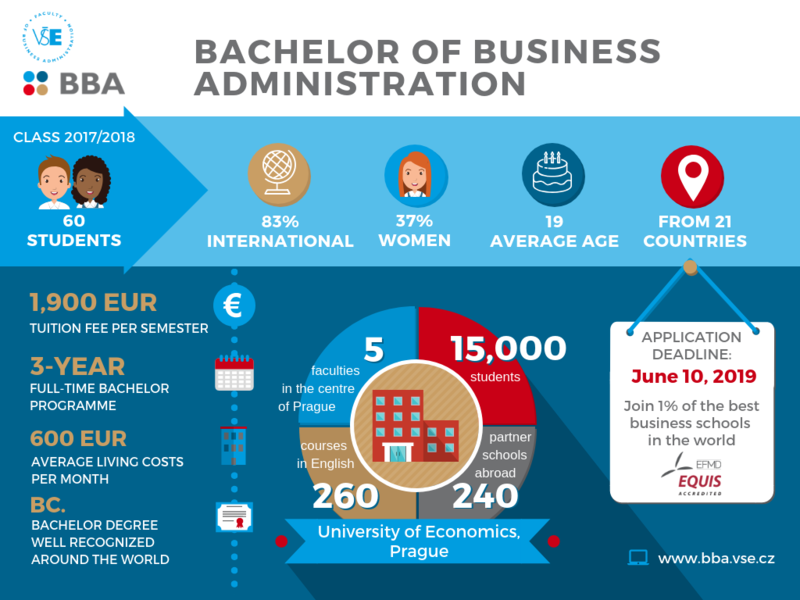 The application deadline for the Bachelor of Business Administration (BBA) programme is on June 10, 2019. You can find all the requirements necessary for completing your application down below or here. If you need help with submitting your e-application, see the guide here. Submit an e-application and pay the application fee until JUNE 10, 2019. Lost a few words writing an essay on a given topic and talk to us for a while within a brief interview in Prague or on Skype. Send us the scan of the translated and notarized copy of your secondary school leaving certificate. The results of entrance tests and delivered essays will be announced during JUNE 2019. Pay the tuition fee (1900 EUR/semester), get your visa documents (if needed) and you are ready to go. The aim of our Bachelor of Business Administration degree is to educate analytically and socially responsible minded business professionals with a broad economic overview and a focus on managing business performance. The study field is suitable for students with analytical thinking who are interested in the business environment, particularly for those with an emphasis on management and building companies of all sizes and legal forms of ownership, industry and business sectors. Graduates will be able to participate in the execution of economic and managerial functions at mid-management levels in companies and other institutions, where business management education is expected. They mostly start their careers at industrial enterprises, enterprises operating in the energy sector, transport and storage, trade and services or consulting firms.